Rebecca Solnit’s career and new memoir, The Faraway Nearby, assessed. The prolific writer and scholar locates the epicenter of our changing world on the left coast. Rebecca Solnit’s new book is The Faraway Nearby. Typically, the term “outsider artist” describes a particular kind of creator whose identity resides outside the boundaries of the widely held idea of who creates art—notably, outsider artists are often mentally ill, criminal, or very young. Since Roger Cardinal coined the term 40 years ago, many other labels have sprung up to describe the work of artists on the edges of the mainstream (indie, alternative, DIY), but true outsider art resides beyond the fringes of a market niche, in the dark chasm of the unseen, the unheard, and the unlabeled. 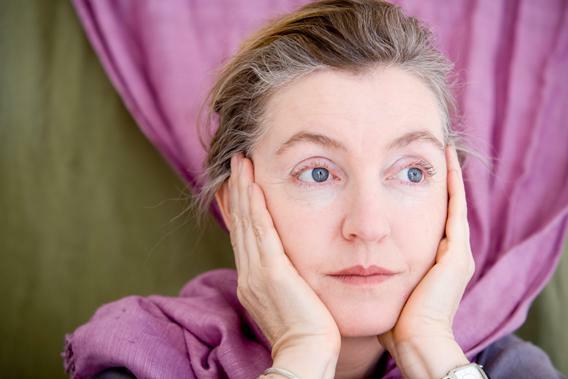 What to call, then, an artist like Rebecca Solnit—an independent scholar who has produced 17 books on topics varying from visual art to disaster politics, but who is by no means a household name? Solnit has a dedicated readership, but her claims and ideas often radically challenge mainstream beliefs and systems. She belongs to no institution or organization, and her work often has the idiosyncrasies of an autodidact. Her outsider tendencies are even present in her style: Her circuitous, associative, indirect mode of argument doesn’t conform to the standard assertion–evidence–analysis routine of most research-based writing. Solnit is, decidedly, somewhat other. Though the volume is an exploration of Ireland as a landscape and a political entity, here we are discussing the West—and Westerns! This easy allusion to the West crops up again and again. For Solnit, in this book and in others, the West is either a subject itself or a fulcrum used to help unearth new ideas and unusual analysis. Perhaps this subject is so productive for Solnit because she is of the West yet outside it at the same time. She grew up in the Bay Area and currently resides in San Francisco, but in works like 2000’s Hollow City, she emphasizes her remove from the region’s changes over the past two decades. That book, a collaboration with photographer Susan Schwartzenberg, is an account of the first dot-com boom in San Francisco. In it, Solnit weaves anecdotes and images of late-1990s neighborhood-gentrification with accounts of the more sinister and systematic ravages of the same neighborhoods under the guise of “urban renewal” in the 1970s. It’s a damning critique of San Francisco’s newly wealthy, and as close to a polemic as Solnit gets. She goes on to observe that Hollywood and Silicon Valley—California’s two most visible centers of industry—have changed the world from “a world of places and materials to a world of representations and information, a world of vastly greater reach and less solid grounding.” Unlike, say, Jaron Lanier or Evgeny Morozov, Solnit doesn’t have an insider’s comprehension of the nuts and bolts of this transformation. She does not engage with technology at a granular level. She simply suggests—elegantly and through almost every topic she takes up—that we are in the midst of a sea change, and that the West is its center. Solnit has approached the mythic West from an impressive range of angles: through California Cold War artists (Secret Exhibition, 1990), through American Indian history (Savage Dreams, 1994), through photographic exegesis (Yosemite in Time, 2005), through cartography (Infinite City, 2010). Not every book of Solnit’s, however, has the West as a grounding element. There’s a subset of her work that leans more toward memoir, though that label isn’t entirely accurate. And when Solnit’s distance collapses—when she relies on purely personal material, that is—she can become too abstract, as in one of her best-loved books, 2006’s A Field Guide to Getting Lost. Note that the idea, west, is still here, but it’s tellingly lowercased. It’s as if Solnit is describing her own personal, internalized version of west—a “surprise, a gift, a revelation.” Interesting and beautiful, to be sure, but rather pale in comparison to the oracular eye she brings to the larger, iconic West. The book lacks the edge of one like Wanderlust: A History of Walking, a 2001 Sebaldian exploration of landscape tempered by occasional critique of American car culture. Where Wanderlust had politics, Field Guide has only poetry. Solnit’s new book, The Faraway Nearby, is being marketed as a companion piece to Field Guide. That’s an accurate description, both in content and in spirit. Faraway is another mostly personal book— it deals with Solnit’s mother’s struggle with Alzheimer’s, Solnit’s own breast cancer scare, and her trip to Iceland for a writing residency. The book is a lovely one that, not unlike Joan Didion’s The Year of Magical Thinking, may bring many readers catharsis or consolation. But its universality feels somewhat hollow. One loves Solnit more for her intelligence and her uprightness than for the broadness of her appeal. Perhaps my trouble with both Field Guide and Faraway is that in them, Solnit no longer plays the outsider. There’s nothing more universal than a meditation on the human body, after all. And while there are many ways in which Solnit is not a true outsider artist—she’s engaged with a larger writing community and tradition, her work is widely distributed, she is not isolated or institutionalized—when she’s positioned as somewhat at odds and apart from her subject matter, her prose takes on an urgency that’s electric. She’s not railing at the gates in these more personal books, and stacked against her larger body of work, perhaps it’s unavoidable that they feel less immediate. Here is Solnit at her most stimulating: pointed (even outraged), grounded in history, observing from the outside. We’re back in the West, too, and Solnit’s long study of it produces an easy familiarity here; she’s not afraid of repetition or colloquialism. Will Solnit’s message get through? Being invisible—or worse, ignored—is the risk an outsider takes. But the more specifically and critically she grapples with the systems and people that form the West today, the more crucial Solnit’s writing gets. Her message is one that a city with a tech-booster mayor, with an economic engine disinterested in supporting the arts, social justice, or community, with a guiding ethos of the quick, the flashy, the “disruptive,” and the virtual, needs to hear. The Faraway Nearby by Rebecca Solnit. Viking.